Kellaway's departure will come as a surprise to some as he has often made a good impression in the black, green and gold this season. The Australian back, who can play on the wing, at centre and at full-back, has made 19 appearances since joining Saints from Super Rugby side the Waratahs. 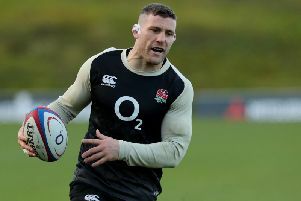 The 23-year-old has scored four tries to date, but he will be leaving when his one-year deal comes to an end at the conclusion of the current campaign. “I’ve had a great time during my year with Saints; I really think this rugby community in Northampton is special and unlike anything else in the world," Kellaway said. Tuitavake has been at Saints for much longer, having joined from Narbonne in 2016. The Tongan centre has made 32 appearances for Northampton but been unable to secure a regular starting spot. “I’m really proud to have played for a great club in Northampton Saints and I want to thank all the supporters here at Franklin’s Gardens for their encouragement over the last three seasons,” said Tuitavake.